Oh hello Sony Alpha 850! This is the very nicely priced, slightly down-specced version of the A900. A full-frame digital SLR for under USD2000! What’s different from the A900? The A900 viewfinder has 0.74x magnification and 100% coverage. The A850 viewfinder has 0.74x magnification and 98% coverage. Is that 2% that much of a difference? No, honestly – if you put them side-by-side you would not be able to see the difference in viewfinder size! As for the number of pixels you gain outside the viewfinder on 98% coverage – the square root of 98% is 99%. So take the A850’s 6048 pixels wide – 1% is 60.5 pixels which makes 30.25 pixels off the left and right. Honestly, not much more. However, there are those who can feel the difference who say it is more apparent on longer focal lengths. With longer focal lengths I tended to shake while framing, nulling the accuracy of putting a subject exactly on the edge of the frame. So, to make the most of a 100% viewfinder you’d want to put the camera on a tripod. Oh, and the RMT-DSLR1 infrared remote is not included with the A850. It is speculated that the A900, having a movable 100% viewfinder mask, makes it more expensive (presumably, the factory checks alignment and moves the mask to cover the proper 100% area). The A850 might not have a moveable mask. That said, the A900 is said to have a superbly aligned 100% viewfinder, unlike some other brands which have a 100% viewfinder but the sensor/viewfinder is misaligned slightly. Cosmetically, the A900 mode dial has embossed PASM lettering, while the A850’s is printed. Minor thing. I suspect that the A850, due to the different finish, might attract people subconsciously. (Short break for the ladies.) 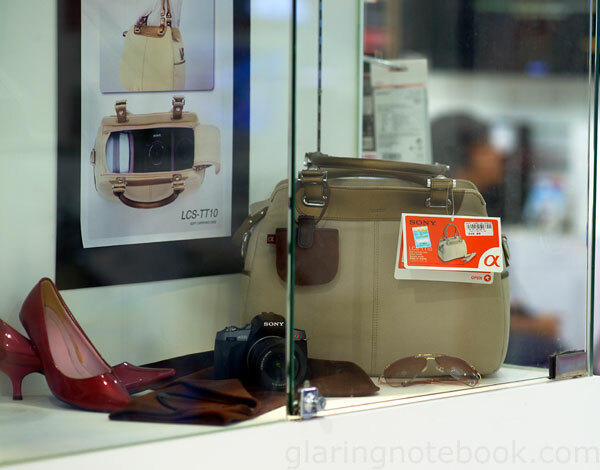 Here’s the new LCS-TT10, a fashionable camera bag. You can see just how big it is, next to the A230 and the pair of red heels! (Short break for the guys.) 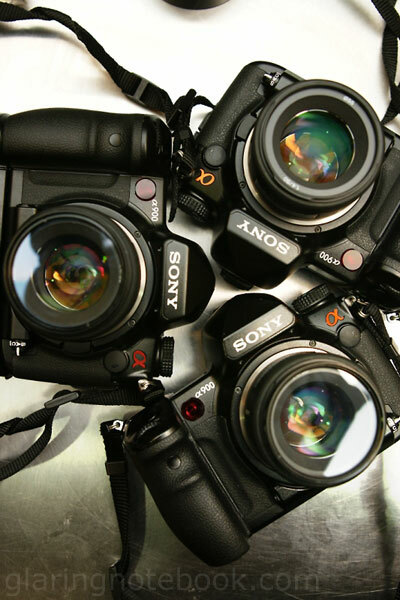 Here’s 3 A900 bodies with Sony 50mm F1.4 lenses. Thanks Signither for sending me the picture! 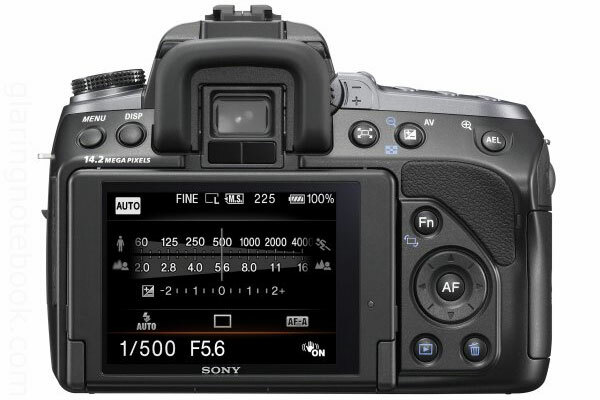 And now, for the Sony Alpha 550! This has a 14.2 megapixel CMOS sensor. Rear view. Somewhat a mix between the A350 and A380 design, with thankfully the full A350 grip. This is truly the successor to the A350 – it has a swivel screen with increased articulation (it can face 90 degrees downwards now) with a 3″ 640×480 screen. 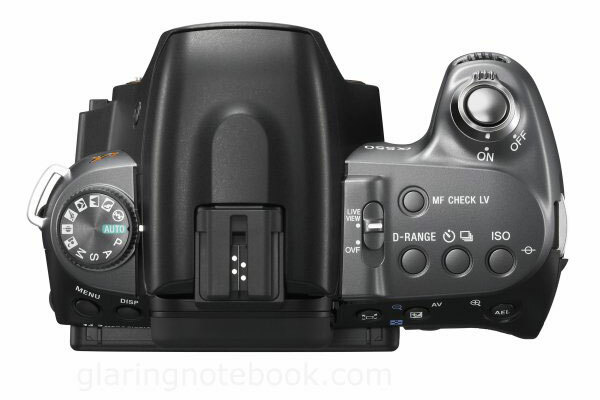 No more noisy-at-ISO1600 14.2 megapixel CCD sensor! The A500/A550 has a bigger viewfinder than the A300-A380’s tiny one, thankfully! At least, we know it can do 5 FPS with continuous AF and auto exposure in between frames. There is also the A500, but that’s the not-so-hot sister – it only has a 12 megapixel CMOS sensor and a 3″ 320×240 swivel screen, and lacks the 7 FPS Speed Priority mode. It also has MF Check LV in addition to the Quick AF Live View introduced in the A300/A350 – it uses the main sensor for Live View, but in manual focus only. You can magnify it either 7x or 14x. It will even auto-gain (brighten up). 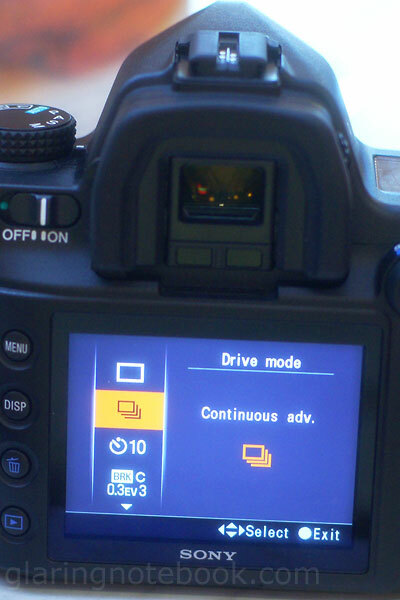 However, it does not stop down the lens, and there is no DOF Preview button on the A550. It also drops the mirror first before flipping it up again to take the shot (redundant, like a lot of Live View implementations). If it just tripped the shutter without the mirror it could’ve removed vibration and made for a quieter shot. It has Face Detection and Smile Shutter when in Live View – very very very cool! Face Detection makes sure it focuses on a face, and exposes the face properly (and probably tunes the white balance too!) Smile Shutter is too fun on my Sony Cybershot W190 and I am glad to see it on a dSLR – it will come in handy when you don’t want to set a 10 second timer to take group shots when the camera is set on a surface. It has DRO (up to Level 5) like the A700/A850/A900! Great stuff for JPEGs. There’s Auto HDR – it takes 2 successive frames. You can specify how many EV are these 2 frames apart, up to 3 EV. From samples I’ve seen it looks much better than DRO Level 5! Of course, I am in no rush – if the A700 replacement is a better B Cam, I might wait for that! 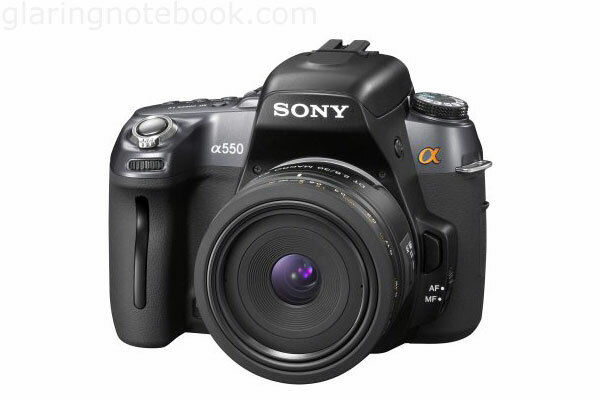 The A500, A550 and A850 are not using backlit sensor technology (Sony calls it Exmor R on their Cybershot and Handycam series). It is said that because the circuits that cover regular CMOS sensors are the same size whatever the size of the sensor, so while a tiny sensor might gain 30-40% in light-gathering capability by becoming backlit, a bigger APS-C or full-frame sensor gains maybe only 5%, thus not justifying the cost. That said, the A550 samples on the Internet look surprisingly clean even at ISO3200. Go! A Sony 3CCD still video camera that uses Canon and Nikon lenses! Still-video cameras have some inherent limitations. These cameras use CCDs designed to capture a full frame in two passes, grabbing first the even-numbered scan lines and then the odd-numbered ones. To accommodate this interlacing, a still-video camera’s CCD has smaller light-sensitive cells than the full-frame CCDs used by most digital cameras. To compensate, a still-video camera has to do more manipulation of the CCD’s data, making images more prone to undesirable artifacts: fuzzy fringes surrounding the objects in a high-contrast scene, or vibrant colors that bleed slightly into surrounding areas (see “Comparing Image Quality”). A digital camera’s CCD and its support circuitry are designed from the ground up to deliver a digital result. Because the CCD doesn’t require the additional elements needed for interlacing, its light-sensitive cells can be larger and closer together. This entry was posted in Geek, Pictures on August 31, 2009 by 2konbla. sweet mother of alpha! wow-ie mannnnnnnnnn! simply lurving it for the @550.. how much? i’m grateful that sony bring back the A3200/300/350 hand grip on the A500/550 camera. 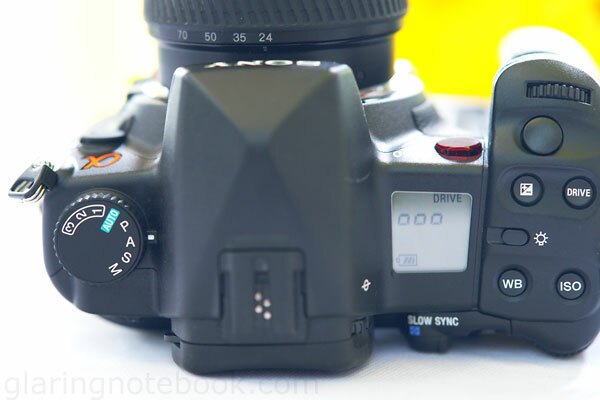 one of the turnoff i had on canon 400d last time is the hand grip. basically jaw drops when sony did it in 230/330/380. flysheep: Yes, the lesser features are very justifiable. If you need it, you need it, but most people won’t.